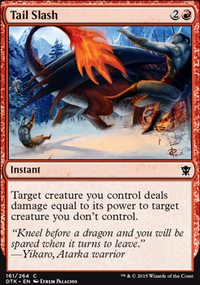 When Dragonlord Atarka enters he battlefield, it deals 5 damage divided as you choose among any number of target creatures and/or planeswalkers your opponents control. Diamond isn't actually all that hard. It has an extremely weak compression strength. In fact, if you took a diamond and slammed a typical roofing hammer down on it, you would shatter it. Lol. Lazotep's real trick is that it can withstand the journey through the blind eternities. Most biological tissue is warped, distorted, and destroyed as it venture through them. 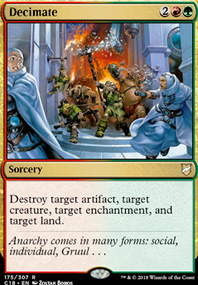 The Planeswalker's spark is what prevents this from happening. Non-biological materials can pass through, hence the reason the Planeswalkers don't go all T-1,000 and become naked on the other side. Having said that, in order to move an army of the dead from one plane to another, Bolas coated them in Lazotep. 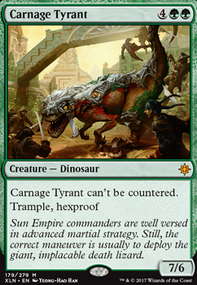 Yes this made them a lot more durable, but it was actually to prevent their bodies from being destroyed on the journey. 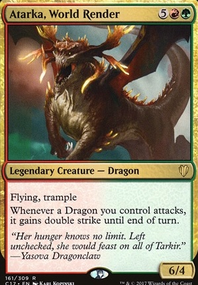 Bontu was a powerful servant of Bolas. 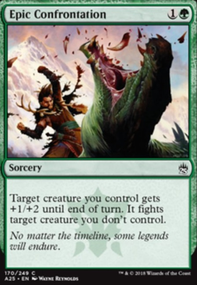 In fact, it was Bontu who betrayed the gods and allowed Bolas to kill the ones that he did. As a "reward", Bontu was the only god who's mind was not wiped. Bontu had to live with what she did. Yup. Bontu is a woman :3 As is Dragonlord Atarka . 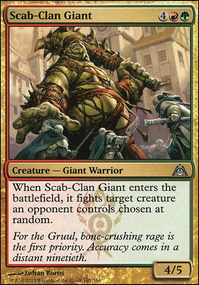 Wizards does love themselves some giant scaly ladies! 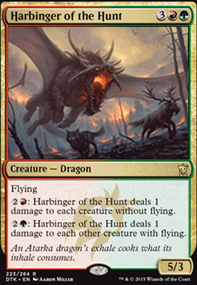 Hmm... Destructor Dragon , Glorybringer and maybe Dragonlord Atarka ? Those are all good cards its just a suggestion. 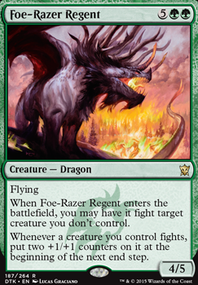 If you are looking to maximize your potential with a Fight-centric deck, I'd suggest you also run a few copies of Frontier Siege for it's Dragon's mode and jam-pack the deck full of heavy hitters: AKA high power. 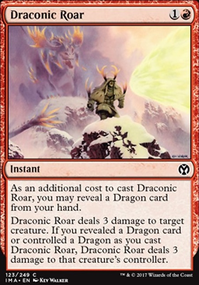 If you use Frontier Siege, you can maximize impact with Dragons. Now you have heavy hitters and flyers. Couple this with Atarka, World Render and Dragonlord Atarka as they are both great for this sort of thing. 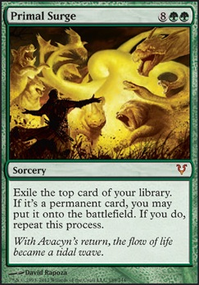 Not to mention the double-strike anthem alongside the burn ETB is sweet. You can also run Foe-Razer Regent for more intense fun. Coupling on the anthem idea, there's also Crucible of Fire, which will allow your Dragons to be even larger when they fight. This will give you plenty of ramp support. You can fix the amount as you see fit based on your deck's overall needs. 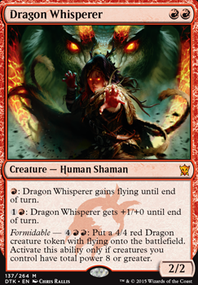 You will also want to cheat out Dragons. Descendants' Path is wonderful for this. 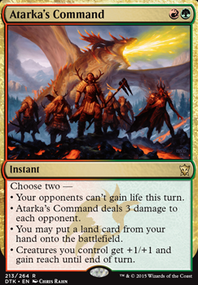 If you are going to choose to run Planeswalkers (Which, with so many flyers you should if you got the room for them), I'd suggest either Sarkhan Vol, or Sarkhan, Fireblood. 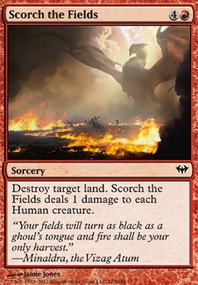 Fireblood is the clear winner here as he generates more precious mana, but Vol is a nice choice if you'd like to not only fight a creature but attack with your Dragon as well on the same turn. 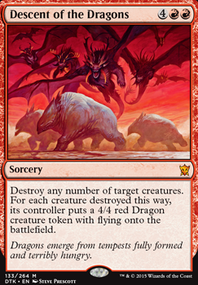 I'd also recommend at least 1x Utvara Hellkite as when you do a full swing, you're going to create a ton of tokens - all of which kick in Frontier Siege. 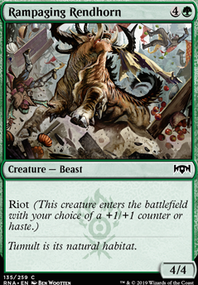 Since those are also all 6/6, they will likely survive and thus become 8/8s with a single Foe-Razer Regent. 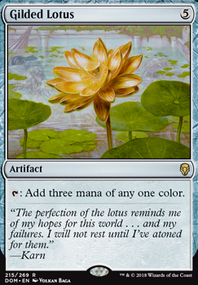 Jesus, I might make this deck. I've got like so many Dragon decks I have literally lost count. Even two EDH Dragon Tribal decks. 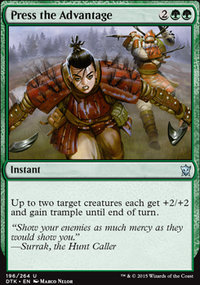 Dragon Tribal is my #1 favorite Tribal :3 They are just so insanely fun to play with. Thank you, those are good suggestions. 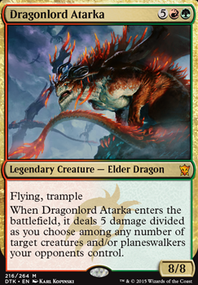 Dragonlord Atarka is super good, no doubt. My hardest decision is into adding those lands or not. My mana base is definitely improvable, I will consider what to swap there!